Professor James Otteson of Wake Forest University, and the Executive Director of the BB&T Center for the Study of Capitalism, talks about the foundational ideals behind capitalism. Dr. James Otteson joined Wake Forest in the Fall of 2013 as Executive Director of The BB&T Center for the Study of Capitalism and Teaching Professor of Political Economy. In 2015, Dr. Otteson was named the Thomas W. Smith Presidential Chair in Business Ethics and in 2016 he was named a Professor of Economics. Before coming to Wake Forest, Dr. Otteson was joint professor of philosophy and economics, and philosophy department chair, at Yeshiva University. He has taught previously at New York University, Georgetown University, and the University of Alabama. He also serves currently as a Research Professor in the Freedom Center and in the Philosophy Department at the University of Arizona, and he is a Senior Scholar at the Fund for American Studies in Washington, DC. Moral Lessons on Capitalism from Its Greatest Champions and Fiercest Opponents James R. Otteson (ed.) Edited by the Executive Director of the BB&T Center for the Study of Capitalism at Wake Forest, the official reader of the Adam Smith Society provides perspectives on free market thought through readings on the nature, purpose, and effects of capitalism. 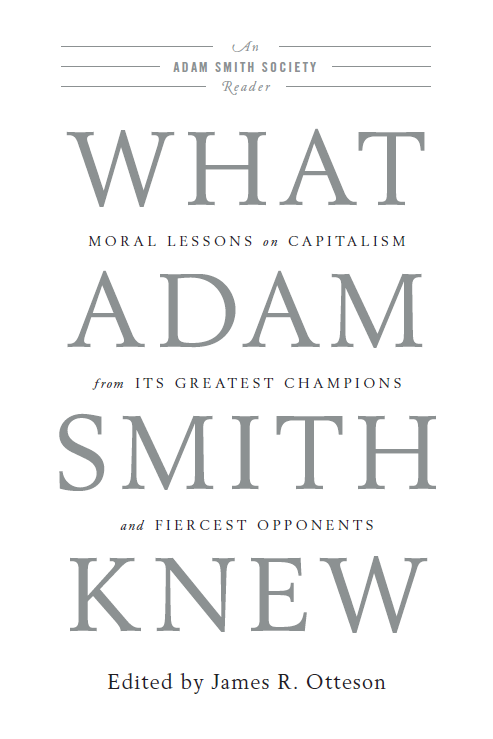 In addition to Adam Smith himself, the selections gathered here include essays and excerpts by thinkers ranging from Locke and Rousseau to Hayek and Cass Sunstein.